There is one particular type of game that has long had a presence on the App Store, and it’s one that has created more than a few big hits over the years. I’m talking about the endless runner, a game that has taken a few forms but while the skin may change, as may the characters involved, the underlying mechanic does not. That mechanic involves something hurtling across/down/up the screen and a user having to tap the screen in order to avoid obstacles. It’s a tried and tested method of producing a game that people love, and the latest to have a crack at it is Wheely World (Free) from Cloudland Studios. Whereas the idea of an endless runner may immediately conjure thoughts of something like Cananbalt, Flappy Bird, or Alto’s Adventure, where a person or an animal is tasked with getting from one side of the screen to another without being impaired by an obstacle, we don’t think there have been many games that have involved some sort of vehicle. Wheely World changes that while also making the scrolling a vertical thing, rather than horizontal. If you imagine Doodle Jump, but with a car, or a boat, or a hovercraft, you won’t be too far off the money. So what exactly do you do when playing Wheely World? Well, as you might have already guessed, the whole aim of the game is to take your vehicle and help it survive as long as possible while a vertically scrolling landscape tries to, essentially, destroy it. There are three terrains to traverse; a forest, a desert, and an ocean and depending on which terrain you are navigating through, you will be presented with various obstacles ranging from giant rocks to islands. Predictably, you need to make sure that you avoid those obstacles by tapping and holding on the side of the screen in order to steer your vehicle. It’s pretty standard fair and again, reminds me very much of the way Doodle Jump handles. The problem is, the vehicles never quite feel like they respond quickly enough, leading to many untimely deaths. Maybe I’m just not very good! While there is plenty to avoid, there are also chests to collect that will offer powerups. 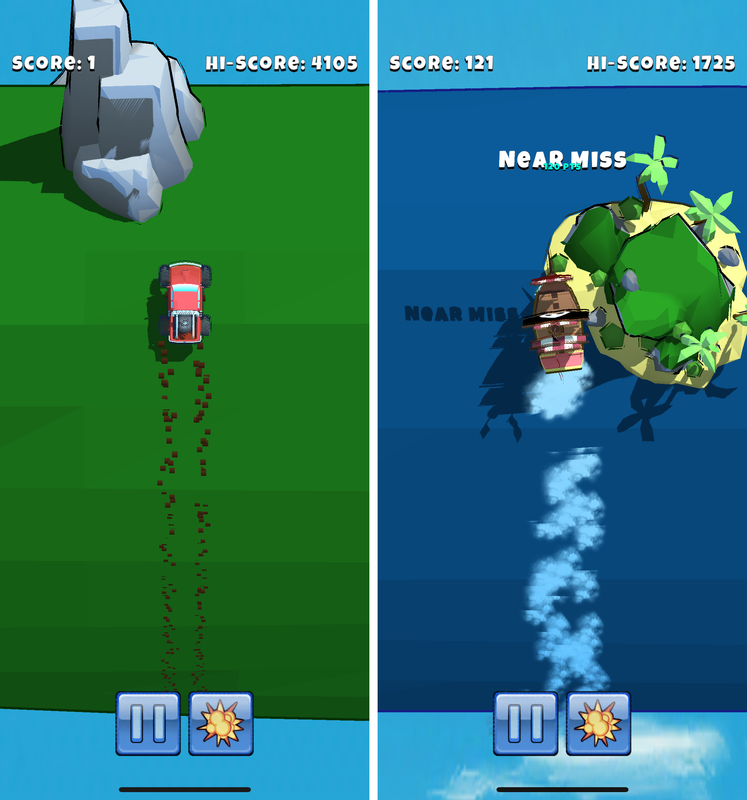 Those powerups may allow your vehicle to fly momentarily, or give it extra speed. These can be great for jumping over some of the biggest obstacles but they are also pretty treacherous to reach, especially given the slow control response time I mentioned earlier. I found myself hitting them almost by accident more than on purpose, although they were always gratefully received when I did smash into one. Free to install, Wheely World does offer an in-app purchase component that will give you access to unlock additional vehicles depending on the world you are playing at $0.99 apiece. However, while the developer does say that selecting different vehicles does alter how they play, they did not appear to make any sort of difference to how the game handled or felt during my play. So whether I was driving a train or a dune buggy, it really didn’t seem to matter one jot. It’s possible that the difference between the vehicles is so slight that I simply didn’t notice, which is still an issue in itself. If I sound like I haven’t enjoyed my time with Wheely World, that’s not necessarily the case. It’s an enjoyable diversion, but absolutely not something I can play for too long before the red mist starts to descend. Yes, that may be because I’m just not very good at it, but I don’t think that’s it. There’s something about the way the game feels that is hard to put into words, but there’s just a lag behind the controls that constantly made me feel like I was doing everything a split second too slow, and in a game where twitch reactions are the be-all and end-all of survival, that gets pretty annoying, pretty fast.